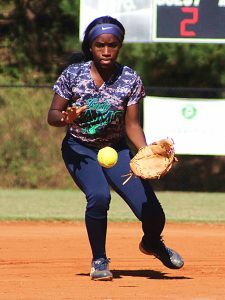 An exciting year of softball in DeKalb County came to an end on Wednesday as all four remaining DCSD clubs fell in their best-of-three series in the Round of 16. The Arabia Mountain Lady Rams fought hard hosting Loganville, but finished another record setting season with a 2-0 series loss in the Class 5A playoffs. Loganville jumped in front early in both games and held off the Lady Rams (23-6) for the series sweep. In the opener Arabia Mountain was down 6-1 after three and a half innings as Loganville used a Caroline Hughes two-out single to center to go up 2-0 in the first inning. Arabia’s Jayln Barker’s RBI single made it 2-1 in the bottom of the second, but Loganville got RBI hits by Grayson Cruce, Lauren Sommerer and Kinley Stewart to pull further ahead at 5-1 in the third inning. Loganville picked up a run in the fourth to make it 6-1. 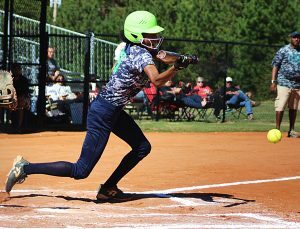 The Lady Rams showed what they were made of in the bottom of the fifth inning as Aubri Gray rapped a two-out, two-run double to center to score Dyamond Brown and Maya Lewis. Gray scored as Loganville center fielder misplayed a fly ball by Colby Richardson to close the gap to 6-5. Arabia Mountain threatened to tie the game in the sixth with runners on second and third with one out, but Loganville reliever Madison Little closed the door and pitched a 1-2-3 inning in the seventh to get the save. Loganville’s Cruce got her team going in the bottom of the first inning with a two-run triple and then scored on a ground out by Sommerer for a 3-0 lead. The Lady Rams found the going tough against Loganville pitcher Caitlyn Canady who set down the Lady Rams in order the first three innings without allowing a base runner. The Lady Rams got the bases loaded in the top of the fourth as Canady allowed two hits and a walk, but a pair of fielder’s choices on the infield kept the game at 3-0. Loganville added an insurance run in the fifth on a double by Cruce to make it 4-0. Arabia Mountain got the first two runners on base in the top of the seventh, but left them stranded as Canady worked out of the trouble to close out the series. In other Class 5A action Chamblee fell in two games to Carrollton. The Lady Bulldogs (22-7) dropped their games by scores of 13-2 and 10-2 to end one of their best seasons in school history. Miller Grove (16-6) also fell in their Class 5A Sweet 16 clash with 13-0 and 19-1 losses on the road to Buford. Dunwoody (22-7) wrapped up its run in the Class 6A state playoffs with a doubleheader loss on the road to Allatoona by scores of 5-1 and 7-1.